If I attended another institution prior to UNA, can I transfer in the education courses I took at the other institution? Education courses taken at other institutions will automatically transfer in to UNA as electives. If you think a course you took at another institution would be equivalent to a course we require at UNA, you can request a course substitution for that particular course. *Transferred courses and/or credits used to meet approved program requirements in professional studies, instructional support, or other approved program requirements (courses other than general studies and Arts and Sciences type courses used to meet academic major requirements) must have been completed at a regionally accredited institution that prepares teachers on the same degree level of certification. After I have been admitted to UNA's Educator Preparation Program, can I take a transient course at another institution and then transfer it back in to UNA? Candidates who wish to take coursework at another institution and transfer those credits back in to UNA must secure pre-approval from the Dean of the college in which the course(s) are taught for both the enrollment and the specific courses to be taken. Candidates on academic probation, academic warning, or conditional admission cannot be approved for transient work. Candidates may not receive transient approval for courses failed in residence at UNA. Candidates seeking transient approval for work at a junior or community college should be aware that a minimum of 64 semester hours must be earned from UNA or other senior institutions to fulfill graduation requirements. What do I need to do for an instructor to write me a letter of recommendation? First you need to fill out and sign a FERPA form and give it to the instructor from whom you are requesting the letter of recommendation. The instructor will review the form and write you a letter of recommendation at his/her discretion. Can I complete the Educator Preparation Program at UNA and use it to become certified in another state? Candidates who wish to complete the educator preparation program at UNA and apply for teacher certification in another state are responsible for contacting the Department of Education of that state to determine specific requirements for licensure in that state. Can I apply online for admission to UNA? If you are a NEW student to UNA, you may apply for admission online. 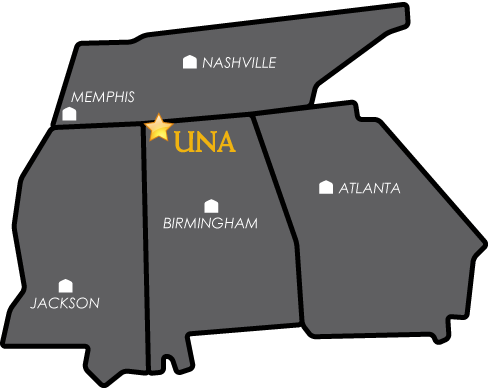 If you have attended UNA in the past and wish to reapply for admission now, you will need to contact the Admissions Office for an application. Applying online requires your initial application fee, whereas re-applying after you have already paid the initial fee does not require additional payment. Can I take online courses in the Educator Preparation Program? Some courses are offered online but some courses require presence on campus. If you wish to see which courses are offered online, please review the Class Schedule.